A Coast Guard is a City minifigure introduced in 2008. 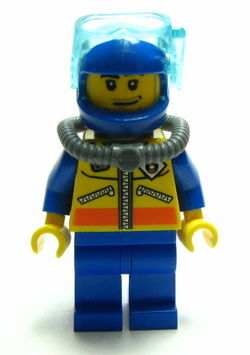 The Diver Suit variation of the Coast Guard minifigure wears a blue scuba diving helmet with scuba goggles. His face has a smiling and happy expression. He wears an air tank for breathing around his neck. He has the standard Coast Guard torso, a yellow body with the Coast Guard logo printed on it, with a radio and zipper. Both his arms and his legs are completely blue. The Pilot variation of the Coast Guard minifigure wears a blue helmet with a black visor attached to it. His face has a determined expression. He also has the standard Coast Guard torso, a yellow body with the Coast Guard logo printed on it, with a radio and zipper. Both his arms and legs are completely blue. Coast Guards are emergency servicemen who protect people out at sea in trouble. With the help of their life boats and helicopters, they save lives daily. The Coast Guards have roles in maritime homeland security, maritime law enforcement (MLE), search and rescue (SAR), marine environmental protection (MEP), and the maintenance of river, intracoastal and offshore aids to navigation (ATON). Facts about "Coast Guard (minifigure)"
This page was last edited on 9 January 2016, at 20:39.